Today's post is super exciting for me... Today, I am taking over butter LONDON's Instagram Stories for their 8 Days of Deals promotion to talk about their deal on their Guilty Pleasures Ultimate Lacquer Stash! butter LONDON was kind enough to send me the set and ask me to do a tutorial for their Instagram stories during their promotion! I am so excited to share this with all of you. With some of the polishes in their Guilty Pleasures Stash, I created this glittery rose gold snowflake nail design! I really love how it turned out and I think it is the perfect feminine twist on the typical snowflake design we're seeing float around this time of year. 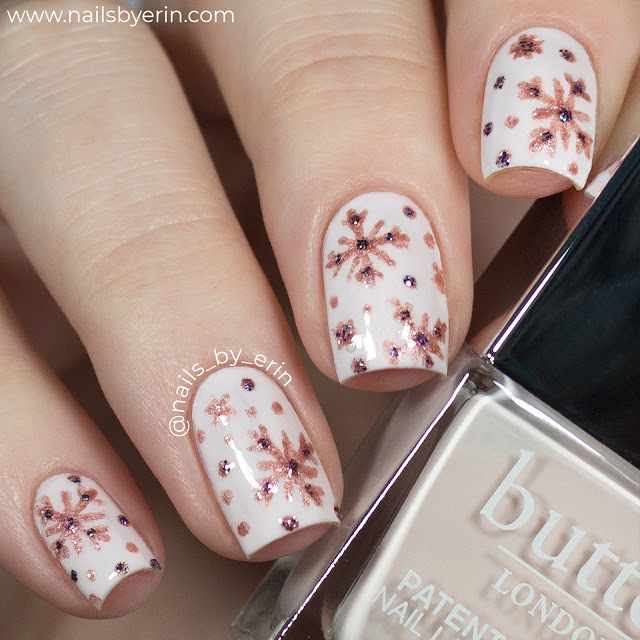 If you'd like to hear more about butter LONDON's 8 Days of Deals and more about this nail design, then just keep on reading! From today 12/8 until tomorrow 12/9, butter LONDON is having a 30% off sale on their 2018 Holiday Collection, which includes the Guilty Pleasures stash! This is the first time EVER that this set is on sale, and it's only live for these two days. Oh, and did I mention it's on Oprah's Favorite Things list this year? Definitely a plus that it has her seal of approval! To create this nail design, I started off with butter LONDON "Twist and Twirl" from their Patent Shine 10X Line. This is a gorgeous pale pink creme. I did 3 coats for full opacity. You might remember my review for 5 other polishes from the Patent Shine 10X line... Since I've tried this formula, I've fallen in love! They are so shiny, long lasting, and the formula is so smooth and easy to apply. This pink is no exception. Then, I used "Rose Quartz" from the Glaze Nail Lacquer line to paint snowflakes across my nail. I did some big, detailed ones, some smaller and less intricate ones, and then filled in any remaining space with small dots. Next, I used "Lovely Jubbly" from the Trend Nail Lacquers and added some of that glitter to the snowflakes! This glitter is sooo pretty.... Super sparkly and they almost seem color shifting. 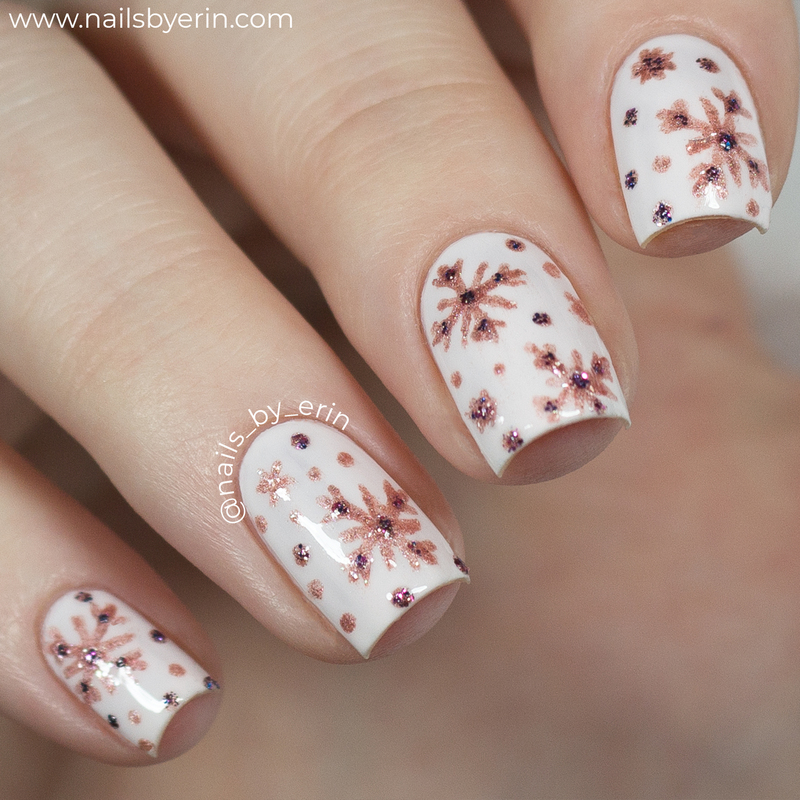 I love the combination of these polishes to make the snowflakes! Finally, I sealed everything in with the butter LONDON Hardwear UV Top Coat. I hope you guys love this design as much as I do! If you're interested in seeing the tutorial, make sure you catch it on butter LONDON's Instagram stories today. Thank you to butter LONDON for having me for this takeover, and thank you all for reading! Your support is the reason I get to do amazing things like this :) Happy Holidays! DISCLAIMER: butter LONDON sent me this set to share with all of you. All opinions expressed on any products are my own.